Since its inception in 1976, international migration is playing an important role in the national economy of Bangladesh. Recent studies on migration have also captured the impact of migration on poverty alleviation and job creation in the rural Bangladesh. According to Bangladesh Bureau of Manpower Employment and Training (BMET) database, from the year of 1976 to December 2014, more than 9 million people had migrated overseas for work from which only 352,269 were female migrant workers, just 3.3% of the total flow. What unfolded in Bangladesh in recent years is a gendered migration process: male migration in response to the requirements of industrialization (construction, manufacturing, agricultural sector like plantation), and female migration in response to the shortage of domestic and childcare workers with UAE, Saudi Arabia and Oman as major destinations. A significant share of female migration has been noticed since 2012 compared to male migration from Bangladesh. In 2014, a total of 76,007 female workers have gone abroad for work, which is almost 18% of the total international migration from Bangladesh. This scenario is quite common for this year as well, where more than 40,000 female workers already migrated in the first half of the running year. At times of banning, restriction and downward trend of male labour migration from Bangladesh, migration of these female workers are keeping the country so valid and alive in global migration movement with sending remittances on a regular basis. But if we recall our past on female migration, it was not an easy walk. In early 1981, a Presidential Order barred women workers of semi-skilled and unskilled categories from overseas employment on the ground to protect their dignity abroad. The order was in response to strong demand of the then association of Bangladeshi migrant workers in Kuwait for banning women from migrating. In 1988, government revised its position by replacing the ban with restriction on migration of unskilled and semi-skilled women. But then in late 1997, an almost complete ban was again imposed on migration of all categories of women except those who were highly qualified professionals such as doctors, engineers and teachers. This was greeted with massive opposition by various sections of civil society: women’s organizations, labour organizations, professional groups, chambers of commerce, think-tanks etc. They argued that it is unconstitutional and discriminatory against women, and claimed that it would contribute to trafficking of women. Since its establishment in 1995, Refugee and Migratory Movements Research Unit (RMMRU) lead by eminent migration expert and rights activist Dr. Tasneem Siddiqui struggled for opening up of female labour migration and safe migration processing for the female workers through its involvement in policy advocacy, research, involvement in global migration forum and close engagement with the Bangladesh government. As a result, government lifted the ban on migration of all other categories of women workers, except domestic workers. In the year 2003 the ministry further eased the restriction by putting an age bar. 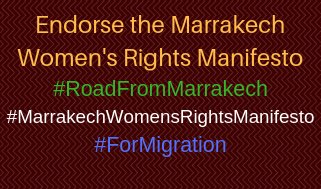 Unskilled or semi-skilled women were allowed to migrate under special permission once they become 25 years of age. The impact of above policy change was experienced straight away. Women constituted less than 1% of the annual labour flow since 1991 to 2003, increased to 5% of the total migrant labour force in 2005. It drastically increased from 2012 (13%) and now female labour migration is in its highest stage with contributing more than 18% of the total international labour flow. Despite all these success, female migration is still stigmatized by the society. They are facing new challenges both at home and abroad. Despite their major contribution to the family, they are yet to give any visible space in family decision making according to latest findings by RMMRU. Studies in Bangladesh, Sri Lanka, Philippines, Indonesia show that compared to men, women migrant sent larger portion of their remittances. As majority of the female workers are domestic workers abroad, their food and lodging are mostly taken care of by their employers. They also do not feel secure to keep their earning in the destination country. Therefore they sent almost all of their earning to their home countries. Remittances of female migrants helped many of their families to come out of poverty. RMMRU Studies on impact of migration found that more than half of female remittances were used for daily consumption, health care and children educations. In absence of female migrants, remittance are usually utilised by the family. If migrants are married their remittances are used by their husbands and if they are unmarried, these are used by the parents or elder siblings. Due to lack of opportunists as well as lack of information on available avenues for investment women migrants can hardly keep control over their remittances. However women developed their own mechanisms of saving for future during subsequent migration. Bank and Non bank financial institutions of Asian sending countries are yet to come up with gender sensitive investment opportunists. Over the last 25 years, there has been little concerted effort to incorporate gender into theories of international migration. Yet, understanding gender is critical in the migration context. We are still in the paradigm of migration studies where people like to talk about migration that “modernized” women, emancipating them from their assumed traditional values and behaviors, rather avoiding their hardship and struggle abroad and their financial contribution in the national economy. The role as a mother, as a wife and as a worker female migrants plays is always absent from the migration research and the tensions she bear with her while in abroad, never get recognition. Women’s migration reflects how globalization has affected and reordered family life. By taking care of all things domestic, women migrants make it possible for local women to take up paid work outside the home. Despite their contributions to their host countries, women migrants are not generally assured of basic protection. As part of the efforts of some countries to ensure that migration is temporary, women migrants cannot easily change employers, even if their conditions are far from satisfactory. Nor can they move to a different job outside of domestic work. Also hidden from the picture are other costs that are shouldered by families in the countries of origin. Many sociologists observed that, as “servants of globalization,” women migrants, in turn, transfer their care giving responsibilities to other female family members or other less-privileged women in the countries of origin. In the process, while migrant women contribute to making family life more comfortable and easier for their employers, they are separated from their own families, who have to fend for themselves. Bangladeshi society in general is still much interested to maintain a distance from these female workers, based on the social stigmatization which likes to project her experience on physical abuse or sexual harassment, ignoring her contribution and sacrifice. Conventional migration studies in sending countries are still concentrated on social cost of female migration, where their economic contribution and idea of empowerment is almost absent. Given these challenges of social recognition and confrontation with social stigma at home and physical safety and security challenges abroad, women migration is in a very vulnerable position right now in Bangladesh despite this upward graph. At this cross road of migration movement in Bangladesh; migration experts, policy makers, activists and other stakeholders should come forward to fight against the social and academic injustice towards female migration and give full recognition about their contribution in social and national development pathways of Bangladesh.